The classical Preisach model of hysteresis, Generalized scalar Preisach models of hysteresis, Vector Preisach models of hysteresis, Stochastic aspects of hysteresis, Superconducting hysteresis, Eddy current hysteresis. Core losses. This new edition has been significantly revised and updated to reflect advances in the field since the publication of the first edition, such as the systematic experimental testing of Preisach models of hysteresis. 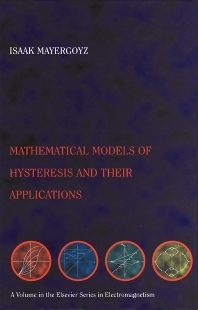 The author has, however, retained the two most salient features of the original, the emphasis on the universal nature of mathematical models of hysteresis and their applicability to the description of hysteresis phenomena in various areas of science, technology and economics and its accessibility to a broad audience of researchers, engineers, and students. Prof. Mayergoyz received his Master and Ph.D. degrees in the former Soviet Union where he worked as a senior research scientist in the Institute of Cybernetics of Ukranian Academy of Sciences before his emigration to the United States. On his arrival to the United States in 1980, he became a full professor of Electrical and Computer Engineering Department of University of Maryland, College Park. He served as a consultant for many years for the Research and Development Center of General Electric Company and has been selected as a visiting research fellow of this center. He has published more than 300 scientific papers and patents as well as eight scientific books. He has been recognized by many awards at the University of Maryland and at the Magnetics Society of IEEE. He is a recognized authority in magnetics which is the area of this book.